Online Islam Magazine Teaches Bomb-Making Skills, Targets Anyone Involved in "Draw Mohammed Day"
If you have ever wondered how to make a bomb at home, what to pack for jihad, or how to communicate in encrypted messages, a new English-language Al-Qaeda magazine has the answers. The first edition of Yemen-based Al-Qaeda in the Arabian Peninsula's (AQAP) Inspire magazine was released on Sunday, according to SITE Intelligence, a US service that monitors Islamist websites. Inspire -- a 67-page publication provided by SITE from jihadist forums that are sometimes password-protected or otherwise difficult to access -- appears to have been designed with care. The magazine, which is packed with sleek pictures of Al-Qaeda leaders and bright graphics, can also be viewed on the popular online document-sharing website Scribd at: http://www.scribd.com/doc/34187004/in?secret_password=ghctd4w5rbkj4tui6k2. 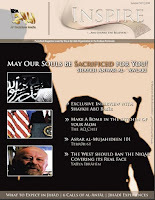 Its cover features an image of a silhouetted man with a rifle under the headline "May Our Souls Be Sacrificed For You!," an article attributed to radical US-Yemeni cleric Anwar al-Awlaki. With article titles such as "Make a Bomb in the Kitchen of Your Mom" by the "The AQ Chef," or a packing list included in "What to Expect in Jihad," parts of the magazine have a friendly, if extremist, scouting manual feel. But despite its sometimes-friendly tone and snazzy layout, its intent is, very literally, deadly serious. The "Make a Bomb" article notes that a device made in "one or two days could be ready to kill at least ten people," while one made in a month "could kill tens of people." The article, which addresses "Muslims in America and Europe," then details the construction of an explosive device using sugar, crushed match heads, a pipe, a Christmas tree-type light, a battery and a clock. It includes images of the different steps. The aim, according to "The AQ Chef," is "conveying to you our military training right into your kitchen, to relieve you of the difficulty of travelling to us." The instructions appear in a section entitled "Open Source Jihad," which is described as "a manual for those who loath the tyrants." "What to Expect in Jihad" offers advice for those who decide to take the fight abroad. "When coming to any land of jihad, it is important to be able to speak the local language fluently," the article advises. It also suggests that would-be mujahedeen (holy warriors) bring a friend with them, and that they learn as much as possible about local culture before travelling. The article also offers packing advice, saying that, "When on jihad, one has to bear in mind that they will have to pack light." It goes on to recommend that mujahedeen bring a "well-built backpack," several pairs of weather-appropriate clothes, "body-cleansing items" and "flexible boots." Items such as computers and MP3 players can also be brought along. The article warns, however, that cell phones with SIM cards in place can be "dangerous," and, along with cameras, should not be used without permission. Religious books make up most of the section on reading material to bring. In another article, the magazine provides instructions on sending and receiving encrypted messages using a computer programme called "Asrar al-Mujahedeen," or Secrets of the Mujahedeen. "Spies are actively paying attention to... emails, especially if you are known to be jihadi-minded," the article says. Thus, the programme is a better option. It also notes that "the enemy" has created a knock-off Asrar programme meant to monitor jihadi correspondence, and advises users to perform an authenticity check. Among various other sections are a poem praising Omar Faruk Abdulmutallab, who is accused of trying to blow up a US airliner on December 25, and transcripts of previous messages from bin Laden and his number two Ayman al-Zawahiri. The magazine also contains what it says is an interview with AQAP leader Nasser al-Wahaishi, and the article attributed to Awlaki, which is on the controversy surrounding cartoons of the Prophet Mohammed. That article argues for the killing of anyone who defames the prophet, especially those involved in the "Everybody Draw Mohammed Day," which was satirically proposed by a Seattle-based cartoonist. "The large number of ('Draw Mohammed') participants makes it easier for us because there are many targets to choose from," the article says.